There are so many metal detectors that you can choose from, whether you are just beginning this exciting hobby or you are a seasoned pro. However, the one thing that you want to be sure about is just what you are getting when you make a decision regarding which detector you are going to use. Some of your decision should be based on the environment in which you wish to sweep. And also, you will want to know about the user friendliness, the feature and the functions of a machine. Let’s take a look at the Minelab SD2200v2 to see what this detector has to offer. The Minelab SD2200v2 is a detector with some impressive technology that offers you some great features and is designed to help you be successful on your hunts. Let’s take a good look at the Minelab SD2200v2 to see what this machine has to offer and if this may be the detector that you are looking for. We will first take a look at the specifications of this device. The Minelab SD2200v2 comes with Koss headphones, an AC adapter and runs on a six volt battery that on average, will give you between ten and twelve hours of power. It also comes equipped with a control box stand and a removable armrest. The standard warranty for the Minelab SD2200v2 is three years. The weight of the Minelab SD2200v2 without including the weight of the battery is a bit over five pounds, 5.25 to be exact. This detector offers you transmission multi period sensing ground rejection and automatic ground balance discrimination. There is a tone ID and the standard search coil is eleven inches. 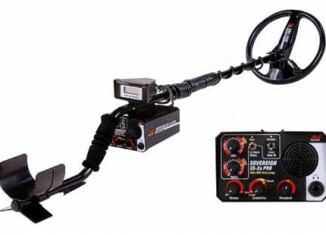 There are three adjustable audio sounds for shallow, normal or deep finds and a three position switch search for either fixed or tracking modes. The Minelab SD2200v2 also offers you a two position iron discrimination which is very important to many sweepers. You will hear tones on a three position audio switch or loudspeaker with your headphones and this can be adjusted to either stereo or mono, which ever you prefer. Many owners of this detector opt for a few of the optional accessories. 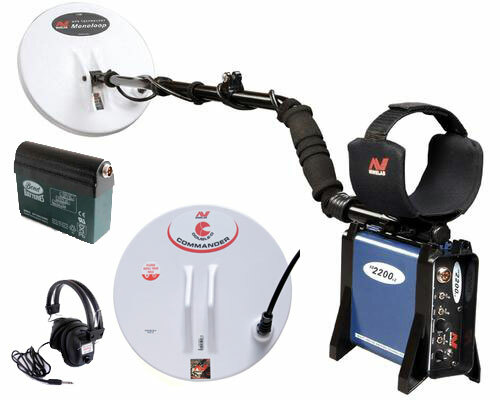 The optional accessories for the Minelab SD2200v2 include carrying bags, coil covers, coin collecting books, digging tools or kits, display cases, dust covers, gold panning items, jewelry cleaners and shovels, trowels and tumblers. The Minelab SD2200v2 rejects strong signals that are given off from junk with its discrimination feature, which gives you more time to go after what you are really looking for. The ground balance is controlled automatically which gives you great ground balance and allows you to capitalize on detection depth as much as possible. The tuning controls are very user friendly, done automatically with an easy to use one push button feature that will control the range of electromagnetic intrusion. You may find the boost amplifier to work well, as you can change very light sounds into very clear target signs. The The Minelab SD2200v2 has some great technology that gives you multi sensing, it diminishes the effects of mineralization and this allows a user to go deeper with a clear, interference free signal. Ground noise is essential eliminated and will basically only give you a tone for a real find such as a nice gold nugget or coin. Other coils are adaptable to the The Minelab SD2200v2, however you will find the 11 inch to work well.